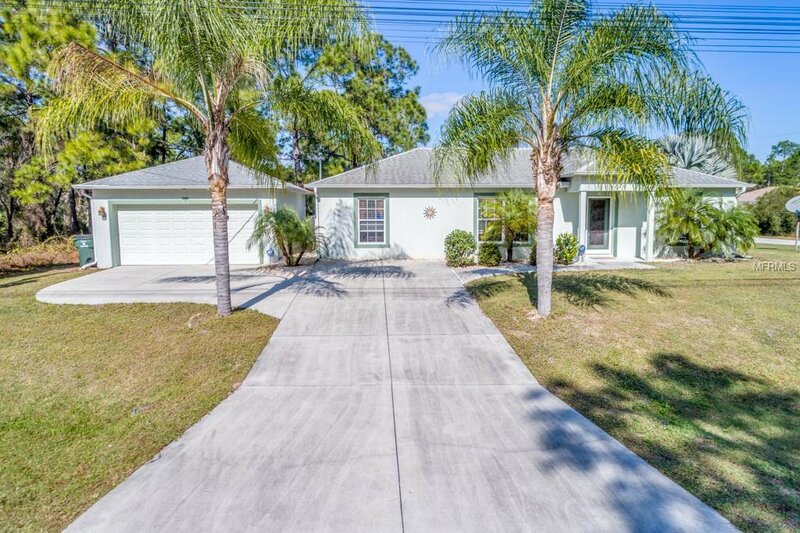 Attention snowbirds and full-timers alike; check out this amazing 3/2/2 home in the fast growing city of North Port! The layout is OPEN with LOTS of closet and storage space! The furnishings are available as well! This well cared for home is situated in a tranquil setting, with great features including a MANABLOC manifold water system, recently upgraded stainless steel kitchen appliances, an alarm system and a large screened lanai for sunning and nighttime relaxation, The over-sized, detached 2 car garage has an additional work space table and installed cabinets for storage! This home has 18” ceramic tile throughout with an internal laundry room. This beautiful corner lot is landscaped amazingly well with several trees to help compliment the look. This home is offered with a 1 yr Home Warranty for peace of mind in your new purchase. Schedule your appointment TODAY to view this wonderful home with schools, shopping and restaurants nearby! Listing courtesy of KELLER WILLIAMS ON THE WATER. Selling Office: KELLER WILLIAMS REALTY GOLD.